Everyone is invited to participate. This includes you moms and dads! 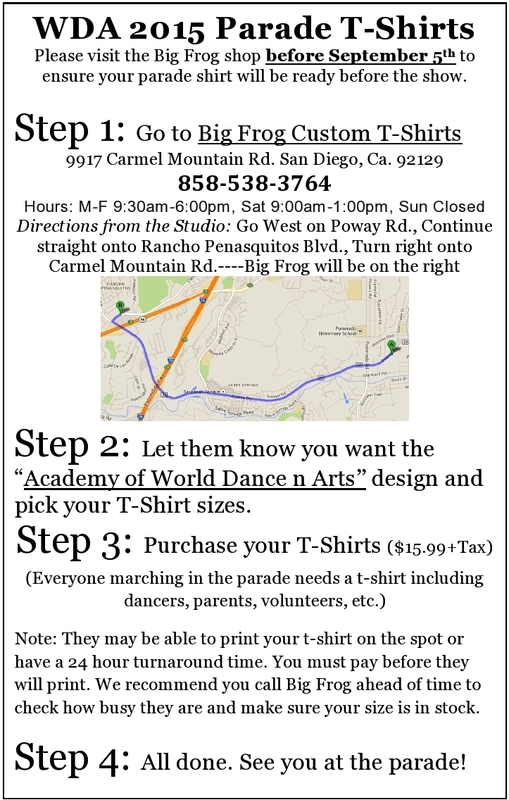 * The parade marches down Poway Rd. East from Pomerado Rd. to Bowron Rd. * We will need plenty of adult volunteers to march with our dancers and help with water. * Meet at 7:45am near corner of Pomerado Rd. and Stowe Dr. Look for our WDA T-shirts : ) WDA 's Participant number is #3. Please eat a good breakfast before hand and bring healthy food to snack on. Parade starts at 9am for spectators. *Roads start closing at 7:30am, so please make arrangements to arrive early and find parking or drop-off. *Please pick up dancers immediately after parade in the Dixieline Lumber parking lot. On the SW corner of Poway Rd. and Community Rd. * Cushioned Tennis Shoes, Sunscreen, Water, Healthy Snacks.